Before we begin I want to give you a WARNING! 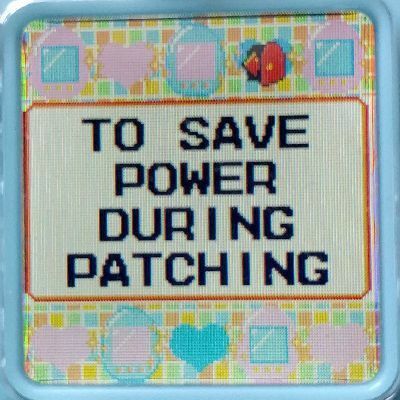 that installing these patches makes changes to your Tamagotchi P's that can not be undone by resetting your P's or removing the batteries. These changes can only be undone by the included restore patches. 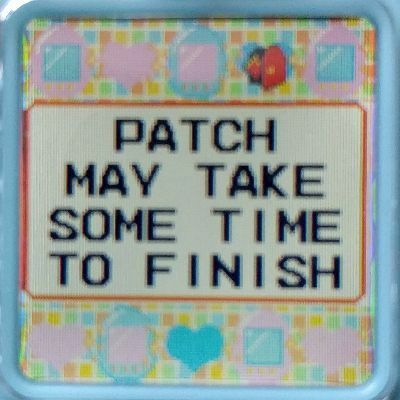 It is very important that you follow these instructions carefully to successfully patch your Tamagotchi P's. Failing to do so may leave you with a corrupted or unusable Tamagotchi P's. Installing these patches is for your own risk. Please read the disclaimer at the bottom too. By putting these patches on your Tamagotchi P's or any other medium you accept the terms and conditions. 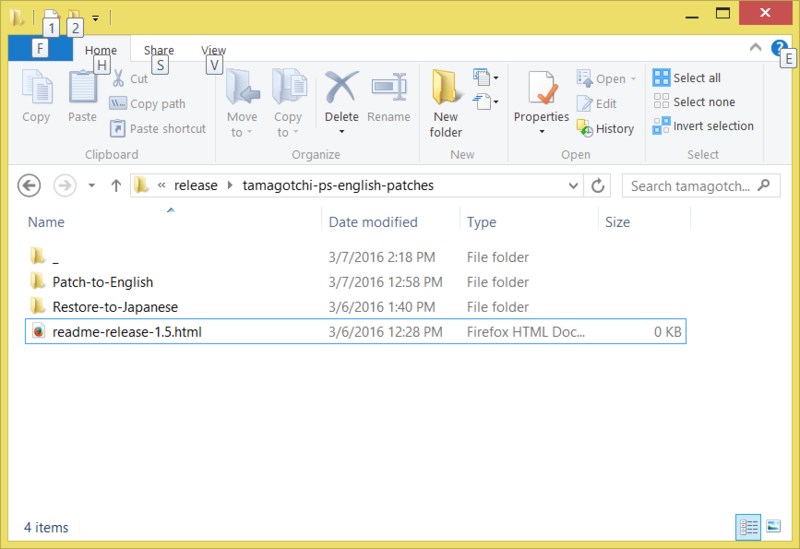 The folder '_' contains images for this how-to page, the folder 'Patch-to-English' contains the patches to patch your Tamagotchi P's into English, the folder 'Restore-to-Japanese' contains the patches to restore your Tamagotchi P's back to Japanese. and the file 'readme-release-1.5.html' is the offline version of this how-to page. 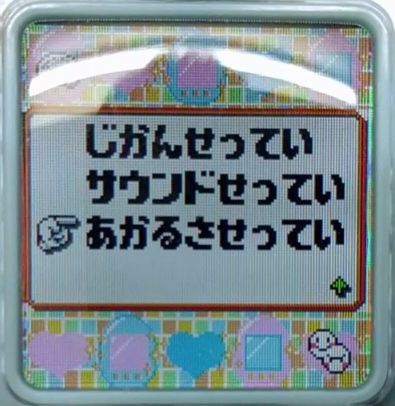 There are two different versions of the Tamagotchi P's. So before you can select any patch files, you have to find out which version you have first. There's a little easter egg feature you can use to find out which version you have. Press button A to highlight the status icon and then press button B to select the status menu. On the Status menu, press button A repeatedly until you see the setting screen then press button B to make the hand icon appear and press button A two times to points to the last option. Press button B to select the brightness option. 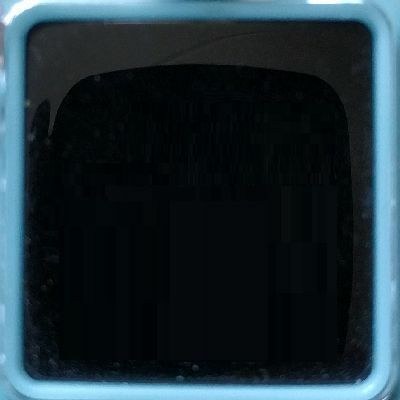 On the brightness screen press both A and B-buttons to reveal the easter egg message. Depending on which version you have, you will see one of the two easter egg images below. Note the different Tamagotchi in each image. Now that you know which version you have, you can continue at the section for your Tamagotchi P's below. 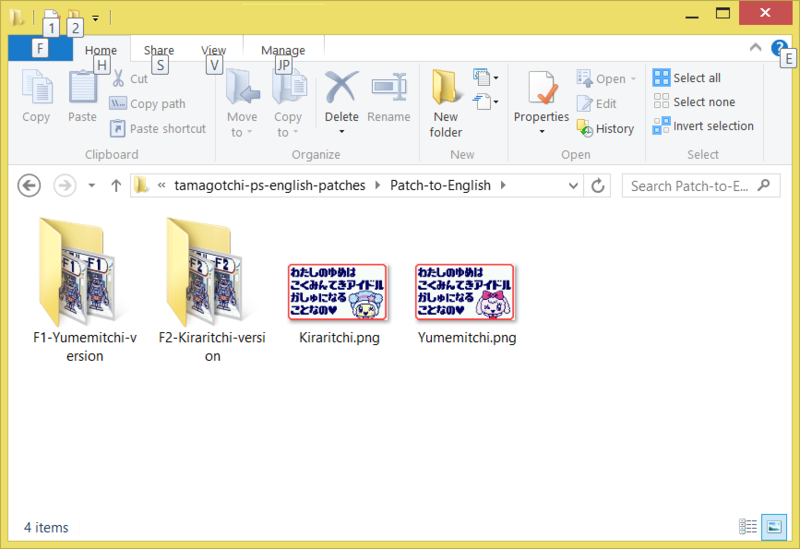 Note that the patches contain F1 in the filename to indicate the Yumemitchi firmware version. 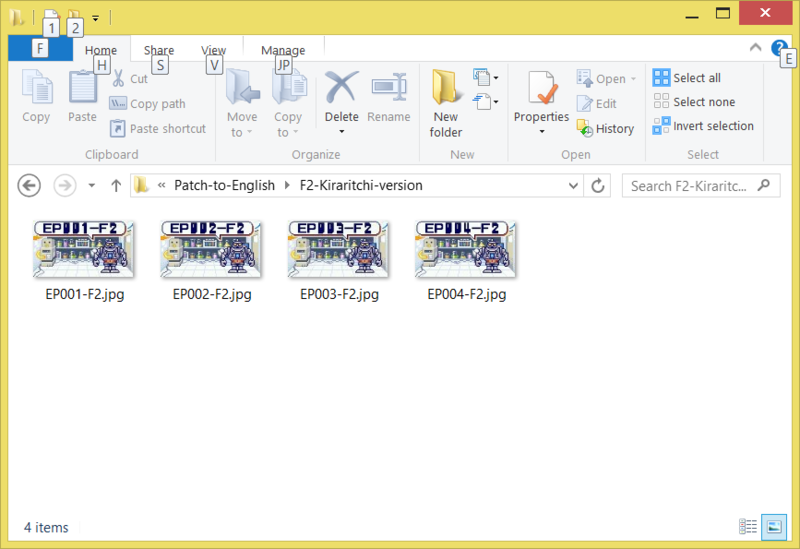 Note that the patches contain F2 in the filename to indicate the Kiraritchi firmware version. At this point I asume you have a compatible device and know how to use it to send files with it over infrared. 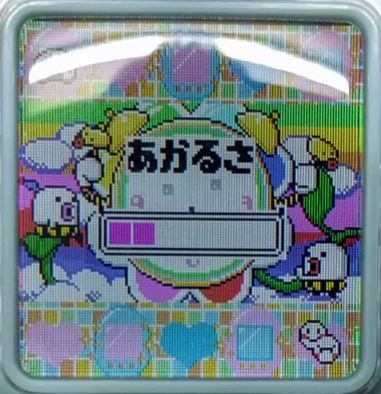 To recieve a file on your Tamagotchi P's, go to the heart icon and select the 3rd option ダウンロード (DOWNLOAD) from the menu. 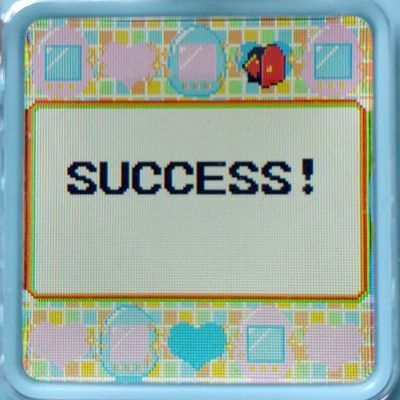 There are four patches that you need to download and install onto your Tamagotchi P's: EP001, EP002, EP003 and EP004. 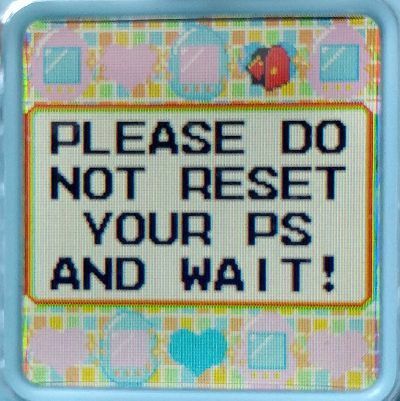 These patches must be downloaded and installed in exactly that order, but because the Tamagotchi P's can only store two downloads at the same time, you will have to do it in two steps. First download EP001 and EP002 onto your P's. 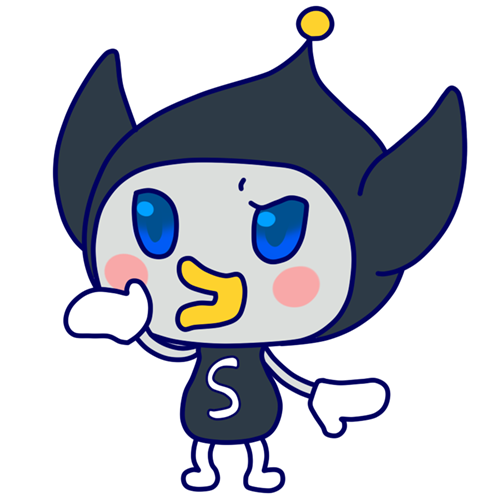 After your P's received a download, you may see the 'FULL' message on the right, in that case, press a button, select an old download and choose 'はい (YES)' to erase it. If you do not press a button in time or do not erase it then the patch you just downloaded will not be stored on your P's and you have to download it to your P's again. After you've downloaded the first two patches successfully. go to the door icon and press button A repeatedly untill you see EP001 and EP002 in the menu list. In case you see EP002 before EP001 then thats no problem, the menu order is not important. Now make sure the hand icon is at EP001, press button B and then choose はい (YES) on the いく? (Go?) menu to run the patch. After the bus animation you will see the messages at the right informing you that the patch will take some time (about a minute), that you should not reset your P's during patching and that the screen will be turned of during patching to save on power. 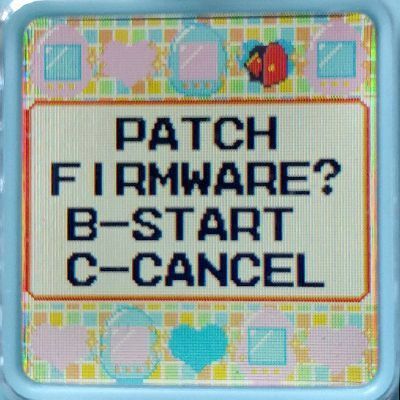 After the messages you will be promted with the question if you want to patch the firmware. Before you press button B to install the patch, you must be sure your P's has new Alkaline batteries or fully charged rechargable batteries and that the back of your P's is put back. It is recommended to put down your P's on a flat and soft surface before you start the patching, so it can not be accidentally dropped. When you are ready press the B button to start the patching. As soon as you press the B button the screen will turn off and the patching process starts. Once the patching has started you can not cancel the process. Do under no circumstance press the reset button or remove the batteries. If you do so then your P's will get corrupted and may become unusable. 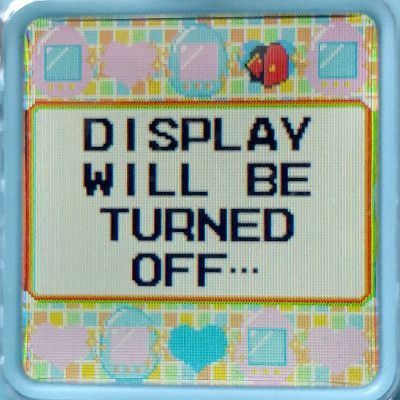 After waiting for about a minute (time may vary for each patch) the display will turn on again and will see a succes message to inform you the patch has completed. With EP001 installed all menus and messages are in English so it will be easier to install the remaining patches. Now go back to the door icon and go through the menu list to repeat the proccess for EP002. Downloading and Installing EP003 and EP004 is basically the same as the first two patches. But when you download EP003 to your P's you will be promped by the 'ITEMFULL' message and you should erase EP001 The same message will also show when you download EP004 in that case you should erase EP002. Once you have downloaded both EP003 and EP004 to your P's you can repeat the install process for the first two patches. After installing all four patches your P's is fully English. However the items, tamatomos, diary entries and friends letters you obtained before you installed the patches including the the default meal and snack in your fridge remain Japanese untill you do a full reset. You can do a full reset by pressing the reset button and choose RESET from the startup menu. By doing a full reset you will loose all your progress.